For the very first time, scientists have linked the properties of single cells to intelligence. 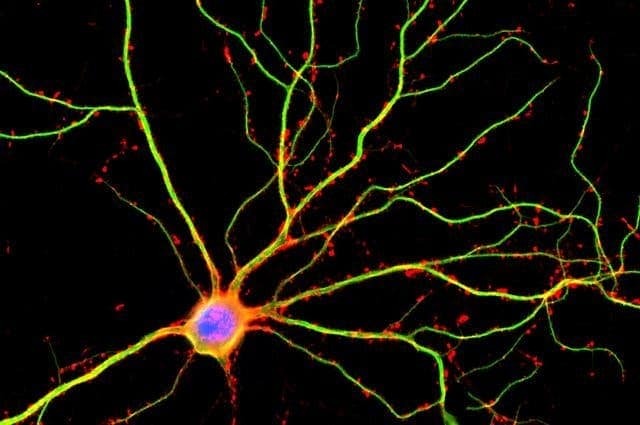 The study shows that people with larger dendrites — the highly branched extension of a neuron (nerve cell) that receives signals from other neurons and transmits the signals toward the cell body — were also more likely to have a higher IQ. These neural extensions transported information more quickly and were more active the larger they were. Credit: Shelley Halpain/UC San Diego. The complexity of the human brain is absolutely staggering, but not all brains are created equal. For instance, previous research has shown that some individuals have a thicker cortex in the frontal and temporal lobes — such people generally have a higher IQ. Other studies have found that variability in brain volume and intelligence may share a common genetic origin. The theory is that certain genes facilitate neuron growth and firing. However, it’s always been challenging to investigate this due to the inaccessibility of the human neuron. An international team of researchers led by Natalia Goriounova, a neuroscientist at Vrije Universiteit Amsterdam, managed this breakthrough after gaining access to cortical tissue, which was removed as a part of surgical treatment for epilepsy or tumors. While the surgery focused on removing diseased tissue in the brain, undamaged samples from the temporal lobe were also collected. In total, living neurons from 46 people were studied in the lab, where their electrical signaling was measured. Before their surgery, each study participant had to take an IQ test. According to experiments, people with a higher IQ also had larger dendrites. In addition, the authors used computational modeling to better understand the underlying principles of efficient information transfer in human cortical neurons. Up until now, scientists used to think dendrites only had the modest role of passing down electrical signals received through synapses, which are neural junctions. However, research carried out at UCLA suggests that could also generate electrical pulses. Much to everyone’s surprise, the researchers recorded five times as many electrical spikes in dendrites than in somas (the cell body of the neuron) when the rats were sleeping and up to 10 times as much when these were actively exploring the maze. And because dendrites are almost 100 times larger in volume this could mean the brain’s computational capacity is 100 times greater than previously thought. Taken together with previous research — such as the study of brain structure and function, but also that of genes — the new study may explain what exact properties may be linked to intelligence. “In conclusion, our results provide first evidence that already at the level of individual neurons, such parameters as dendritic size and ability to maintain fast responses link to general mental ability. Multiplied by an astronomical number of cortical neurons in our brain, very small changes in these parameters may lead to large differences in encoding capabilities and information transfer in cortical networks and result in a speed advantage in mental processing and, finally, in faster reaction times and higher cognitive ability,” the authors wrote in the journal eLife.